Candidates should not have completed 18 years of age as on 31.12.2016, (21 years incase of students belonging to SC and ST categories). International students shall be of Indian Nationality / Persons of Indian Origin (PIO)/Overseas Citizen of India (OCI) Card Holders. The candidates should apply online through APOnline services only. An additional amount of Rs. 20.00 per application should be paid as service charges to the APOnline Centre. Immediately after submitting the application through online, applicants claim reservation under PH/CAP/NCC/Sports should send its print-out duly signed along with copies of the relevant certificates (mentioned below) to The Convener, Dean’s Office, I-3 Block, Rajiv Gandhi University of Knowledge Technologies, Nuzvid, Mylavaram Road, Krishna District, Andhra Pradesh – 521202, by Speed post / Registered post. 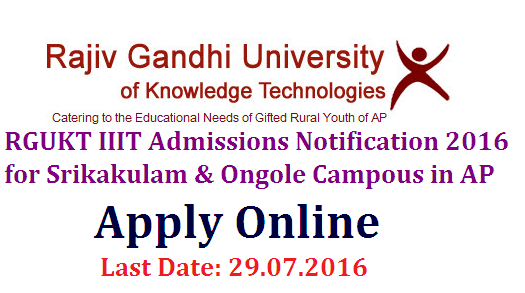 The candidate should write on top of the cover “Application for Admissions 2016-RGUKT Srikakulam & Ongole”.